If you want to make some lighting improvement for the entire house, the following tips may be very useful for you. They may also be appropriate for some small redecorations in particular rooms. Just keep in mind that lightings are essential for putting accents in the interior. Moreover – don’t forget that different rooms require different types of lighting, shadows and nuances! Putting an ordinary lamp in the center of the ceiling or adding a posh chandelier for ornamenting isn’t the entire philosophy of creating perfect home artificial light! Living room – here, you spend most of your time with the family. Most of the domestic activities are also here, so fine lighting setting is mandatory. It could be very original and creative, if you install little lamps on the walls. 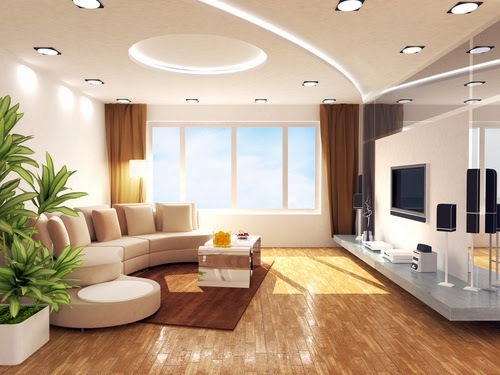 Providing ambient light, you may direct the light to specific parts of the room – decors, new set of furniture and etc. Respectively, you can also remove the faults from the display. Spoilt carpet, which can’t be refreshed may be “hidden” with a LED light in one of the corners. Kitchen – lighting must be functional here! Light up the cooking areas and put a special accent on the kitchen table. If you have a modern kitchen plot, you may install lamps in the ends of it or get the benefit of floor lighting. It is too old-fashioned to believe that kitchen can’t be attractive or charming. On the contrary – even though, most of the domestic regular cleaning activities are performed here, you may still have fun in the kitchen! Improvise – install a lamp right above the sink or put some decorative lights on the fridge! Bedroom – avoid troubled sleep with gloomy and soft lighting. Make romantic lighting settings in bedroom with flickering lamps on the bedside table and the cosmetic table. Don’t select a super posh chandelier with glossy ornaments. Better, cover the ceiling corners with tub-formed lamps in light green or purple. Bathroom – start with lighting both sides of the mirror. Big bathroom may be decorated with Baroque-styled lamps and small bathroom will look brighter with a central lighting system. Make a lighting focus on the area of the shower or embrace the tub with wall lighting settings!